one happy little crafter: the storytime one! Hi all! Back to work for me today, sadly! It was hard work this morning getting the jammies off and putting the uniform back on, lol! Anyway, its challenge time with aud sentiments and what we'd like you to do this time is use a STORY BOOK QUOTE as your sentiment on your card or project. We are sponsored this time my Sassy Studios, so thank you to them! 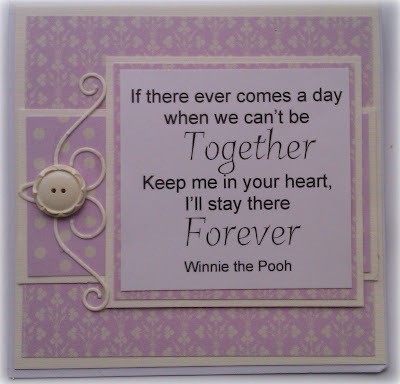 As you can see, for my DT card I went for the master of profound quotes himself, Winnie the Pooh! I think this is a wonderful sentiment! I created this sentiment using arial font, plus another whose name escapes me at the mo! Again, I've used the Fremont Crest from Memory box, with a button from stash! If you'd like to join in with us, or check out the other super DT work, click the logo below! in the pink - keep it clean and simple ( I know we'v got a couple of layers, but I hope its CAS-enough! hi Lisa love the card beautiful! 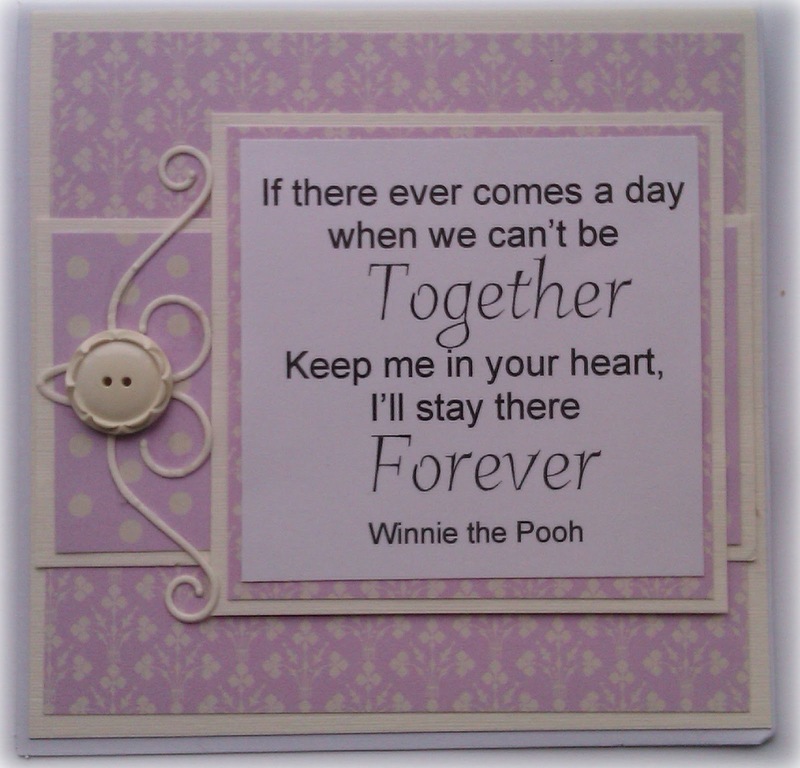 This is gorgeous - love that wonderful Pooh sentiment. Thanks for joining us at In The Pink this week. Awww beautiful sentiment! Gorgeous card - love that Memory Box die too. Thanks for sharing with us at In The Pink... hope to see you again soon! Hi Lisa, awww that is a beautiful sentiment and a very elegant card. Lovely flourish (I have a thing for flourishes and swirls!!) and a great colour. Your makes in the previous post are fab as well and you got a right bargain with the bulldog clips! This is beautiful, love the quote you used, i am so in love with Winnie the pooh! Gorgeous card Lisa. Winnie the Pooh has all the best quotes!